Firstly, the video clip features the opening titles from the first season (1981-1982) of the 80s soap. The music was composed by Bill Conti, an American film music composer who also composed the music for several of the Rocky Movies and the James Bond movie For Your Eyes Only. Perhaps best described as Dallas with grapes, Falcon Crest was an hour long soap (including the ad breaks) which originally aired on CBS in America between December 1981 and May 1990, but was, of course, ported to the UK, although I haven't managed to find details of the exact dates that it aired over here. The storyline revolved around two vineyard-owning families, the Gioberti's and the Channing's who were at war with each other. The show ran for nine seasons (227 episodes) and was set in the Tuscany Valley in San Francisco, which doesn't actually exist in real life, but this fictional it was based on the Napa Valley in California. 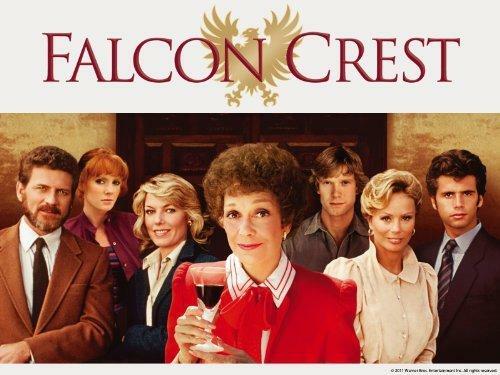 The head of the Falcon Crest winery was Angela Channing (played by Jane Wyman), who was very authoratitive. The problems started when Chase Gioberti (Robert Foxworth) inherited part of the vineyards and winery from Angela's brother, Jason Gioberti, who was also Chase's late Father. He appeared in the very first episode and was killed after a fall at the winery. Angela Channing had two daughters; Julia (Abby Dalton) who was the chief winemaker, and Emma (Margaret Ladd) who had a pleasant personality but didn't work in the family business. Angela also had an undisciplined, lazy grandson called Lance (Lorenzo Lamas) who had a yearning for power and money. He eventually went to work for his Grandfather's newspaper for a short while after Angela became fed up with him. Chase Gioberti had a wife called Maggie (Susan Sullivan) who often sympathised with her husband, and worked as a freelance writer and eventually worked for The New Globe newspaper. Chase also had a son called Cole (William R. Moses) who worked at the winery, and a daughter, Vickie (Played by Jamie Rose and then Dana Sparks), who didn't work or get an education and was pretty disobedient. Angela's faithful Chinese head of the house and chauffeur was Chao Li. He always sided with Angela and provided a shoulder to lean on. Between 1981 and 1984 Philip Erikson (Mel Ferrer) was her lawyer, who was oblivious to what was right or honourable. He eventually became her second husband, but was killed in a plane crash soon after the wedding. The ruthless businessman, Richard Channing (David Selby) first appears in 1982 as the allegedly illegitimate outcast son of Angela's husband Douglas, having inherited half of his father's newspaper. He eventually gains one-third ownership of Falcon Crest. 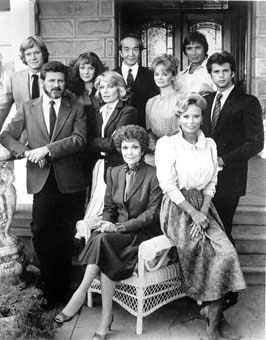 There were over well over a dozen more characters who came and went during the series, and Falcon Crest soon became even more alluring than Dallas. It quickly reached the top ten in the American TV ratings during seasons 2 to 4. During season's 5 to 7 the show dropped well out of the top 10 to between #23 and #28, and during season 8 slumped even further to #52. After spiralling further to #65 in season 9 the show was then axed.